Freezer cooking is totally worth it! And, I agree 100% about the clean up part. is another great resource. She does ALL of the prep work for you from planning the menu, giving you step by step instructions, and giving you a grocery list! All you have to do is go shopping and cook! is TOTALLY the place to go for OAMC! I never would have attempted it without the details instructions there, but now I love it! 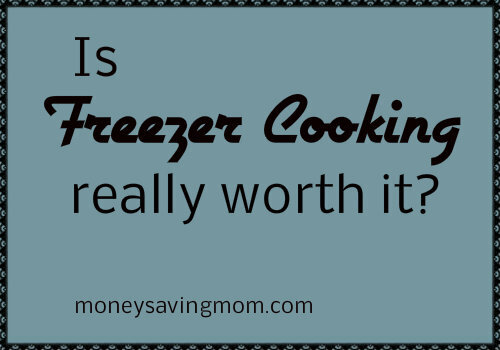 Freezer cooking is totally worth it! I have just started it in 2010 and am hooked, for all the reasons you stated one. After I was not going to the store every few days, I realized how much grocery shopping was stressing me out! I homeschool four kids and my husband works crazy hours so the chances for me to go grocery shopping by myself are slim. So, now I can schedule my shopping around his day off, get it over with and not go back (at least not more than a couple of times for fresh stuff)! This also saves me money because I am not good at sticking to a list, I always leave with several things that I didn’t go to get. Absolutely worth it!! But only if I take advantage of awesome resources online – I’m too lazy to do it on my own. I love ! She makes it fool proof!